Heinrich Dinkelacker has al­ways produced the ab­so­lute finest hand­craf­ted Buda­pester shoes. Dive in­to the com­pany’s rich and storied his­tory. From cut­ting the leather to ap­ply­ing the welt seams and de­co­ration, shoe ma­nu­fac­tu­ring in our Buda­pest fac­to­ry in­volves 300 work steps car­ried out by mas­ter cob­blers. Premium ma­te­rials, mas­terful shoe­ma­king, and per­fec­ted last forms are on­ly a few of the quali­ties that make our foot­wear col­lec­tion so very special. 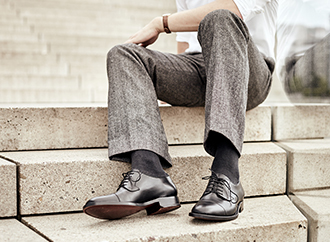 Heinrich Dinkelacker is one of Germany’s most ex­clu­sive men’s shoe brands. It is known for its tra­di­tion, crafts­man­ship, and ex­tra­or­di­na­ry designs.